A knee brace for the masses? Leatt’s budget-friendly Z-Frame has a simple design yet is still a certified medical device and CE certified for impact protection. For serious motocross riders, not wearing knee braces is pretty much taboo. But truth be told, there are pros and cons to knee braces, and casual riders could argue that the price and complexity of high-end knee braces would steer them towards being knee-guard only riders. Personally, I’ve had minor knee injuries wearing both knee pads and knee braces, so I’m not totally dedicated to one or the other. I like the feel, comfort, and freedom of movement I get from pads, yet I do have that back-of-the-mind thought that knee braces could do me better if/when I go down. According to Leatt, they’ve taken what they’ve learned from developing the C-Frame and X-Frame braces and applied it to their new Z-Frame. To keep the price down, the chassis has both glass-filled nylon and carbon injected sections, rather than carbon fiber, like premier braces. The chassis is also made of just three main sections, the thigh plate, the shin plate, and the knee cup, affixed by a simple dual-pivot hinge on both sides of the knee. The hinges are completely enclosed and it doesn’t look like you can replace any parts. There is, however, multiple inserts that limit the amount of extension allowed by the brace. There are 5, 10, 15, and 20-degree options. Also, on the inside of each hinge, there are pads that are velcroed in place that are replaceable with different thicknesses, and I’ll get into those in the ‘Fit’ section. What is pretty cool about a sub-three-hundred dollar brace is that it is both impact and medically certified. According to Leatt’s website, the Z-Frame adheres to the medical device codes of EU CA014741 and USA FDA 10048761 and meets the CE certification of Knee EN1621-1. With a cursory search, I couldn’t find any details on what the medical certification actually denotes, but the CE certification is a straightforward impact test making sure a certain amount of force is stopped by the brace. Using Leatt’s fitment guide I asked for the XL Z-Frame (they come in sizes S, M, L, and XL). My knee width was within the L size range but my oversized thighs wouldn’t fit. This is one downside to any knee brace. To make a brace that is stiff and substantial enough to reduce twisting and hyperextension forces, they have a limited amount of adjustability. But, overall, the XL fit my legs pretty spot on. To adjust the inner shape and size of the knee area, there are three different knee pads marked with the words 'five,' 'seven,' and 'nine.' I’m assuming those numbers are millimeters but they don’t say. At first, I ran the thickest pads on the inside of the braces because I was thinking that I would need to soak up some of the space in the knee area. But, as it turns out when everything is tightened down, the hinges are actually a little higher than the dead center of the knee, putting the pads in contact with the thigh muscles right above the knee. With the ‘nine’ pads in, I had severe discomfort and sore spots on my leg after riding the first day. But then I tried the ‘five’ pads and all the pain and discomfort went away. I’ll get into this more in the ‘Ride’ section. Strap systems are always a major component of knee brace function. If they don’t hold the brace in place, all the technology in the hinges or protective materials goes out the window. The Z-Frames have sort of a three strap system that acts more like a four strap system. You only need to adjust the length of each strap once, and then just snap and unsnap the straps from then on out. The bottom two straps are non-stretchy and go around the upper and lower part of the calf. Securing the thigh section is actually one strap, that acts as two. The lower section of the strap is non-stretchy and connects to the brace above the knee, travels through a loop on the other side of the brace, then doubles back to be secured at the top of the thigh. This upper section has a bit of elastic stretch to it, which is really smart since your thigh muscle flexes and changes shape quite a bit when sitting and standing. One of the main gripes about the brace is how big the knee section is when articulated. When your leg is straight, the knee cup is tucked behind the shin and thigh sections, but when the knee is bent, they slide up and down respectively and expose the full coverage knee guard/cup. Now, I’m happy that there are no gaps when the knee is bent, yet the way it bends leads to the whole knee section protruding off your knee area pretty far. The downsides I can see so far is that the knee cup isn’t that close to your knee in the case of an impact and that super tight pants might be pushed to the limit as you bend your leg. That being said, I’ve worn Fly Lite Hydrogen, Fly Kinetic, and FXR Helium MX gear sets without issue. The shin section is low-profile and tucks into boots easier than some other braces that wrap around the leg more. Speaking of, overall the Z-Frame seems to sit just on the front half of your leg, rather than a more wrap-around feeling that other braces have. This makes the Z-Frame feel less bulky, but also less substantial. Once on the bike, the braces bend and extend smoothly in a very natural fashion - they don’t force your leg in any particular direction. I do, however, like how other braces have some sort of active tension to extend the brace in it’s resting state. For example, Astars Fluid braces have elastic straps that want to pull the brace straight and sort of help you extend your leg when riding. POD braces have the artificial ligaments that get progressively harder to flex therefore doing sort of the same thing, a small but noticeable force helping you extend your leg. This isn’t a huge deal, but something to think about when comparing Z-Frames to top-tier braces. When riding, at first I noticed the solid contact the shin section made with my lower leg. It wasn’t uncomfortable, but it took a little while to get used to it. Then after a few laps, as I mentioned earlier, the inside hinge pads where noticeably pressing into thigh right above the knee. I rode all day with the braces so it wasn’t unbearable, but the next day my legs were tender in those areas. The next time I rode in them, I swapped out the pad to the thinnest pads and it made a world of difference. The pressure points were gone and I could squeeze the bike with my legs without issue. Bike/brace contact is pretty natural feeling. I did feel where the hinges were, but they are flush enough with the brace to give a confident leg grip on the bike. They are also thin enough to have your knees feel pretty close to the bike. Some other braces have given me sore spots on the shin where the brace stops, which didn’t happen with the Z-Frame. Downward migration is a common issue with knee braces and the Z-Frames held their ground really well. I wouldn’t say they were perfect, but with the straps comfortably tight and my boots buckled up, they didn’t really move down while riding. Even with higher-end braces, I typically give my knee braces a tug upward out of habit while riding from the truck to the track, but when I did this with the Z-Frames, they were already as high as they would go. First off, the Z-Frames are not as stiff, rigid, or light as carbon fiber braces on the market. They are also half the price. I would say that this knee brace is a natural step up from high-end knee guards and the perfect knee brace for the first time knee brace wearer. I would also say that they might be great for guys and gals who have worn knee braces but find them to be bulky and distracting. After a few laps, I stopped noticing the braces and this could be that the chassis has just a touch of flex to give a more comfortable ride. Lastly, three hundred bucks isn’t cheap, but it is much easier to swallow than most other braces on the market and, in my opinion, you get what you pay for. and we heard your request for a good knee brace that won't break the bank. Thanks for pushing us! reduces the ACL, Meniscus, and MCL injury risk. 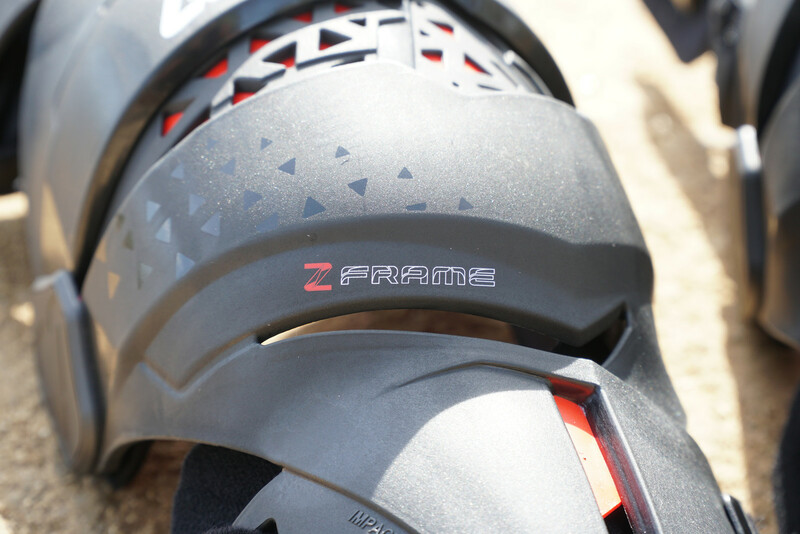 The Z-Frame is also CE certified as a medical device and as impact protection. Maybe it's time to get rid of your knee protectors and get yourself a knee brace? Next step up is the X-Frame for a stiffer chassis and our top-of-the-line cage hinge construction.